Our designers can help you create something that truly brings your vision to life. Whether you require original artwork or adjustments made to existing files, our staff are only too happy to be of service. We want you to be happy with your printed product. For us to be able to do that, you need to provide your files in a ready-to-print format. Follow the information on this page detailing how files should be submitted. If that’s all a bit confusing, please call and our staff will be more than happy to discuss the requirements of the process. Note templates for most commonly used applications are available on our templates page. 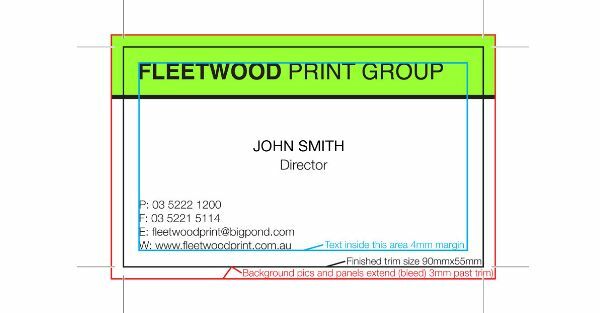 Pdf files should be supplied in CMYK mode, have 3mm bleed and trim/crop marks. PDF's need to be presented 1 page per page, not as spreads, high res press ready pdf. Spot colour or pantone colours to be converted to CMYK (unless the files rerquire specific pms spot colour output / offset printing). Micosoft Applications - Word and Powerpoint will create an RGB file and we will convert it to CMYK for printing. Please be aware that conversions can cause a colour shift. Ensure that fonts are embedded. Please ensure artwork is the correct size! Only if you are submitting files for large format Poster / Banner printing can files be smaller than their final output size. These files can be made up at 25% of the final size. Images within the job should be 300dpi. Adobe InDesign - Convert all spot colours to CMYK values (unless the files are for specific pms spot colour printing) ensure bleed is applied as per the sample above. Include all linked images and fonts used ie: package job from the File>Package menu including all fonts, images. If using Acrobat Distiller to create your pdf distiller joboptions are available here. FPG Distiller Job Options. Adobe Photoshop - Photoshop files must be flattened (not layered) 300dpi and in CMYK mode. Document should have a resolution of 300dpi at full size plus 3mm bleed. NOTE If file is for large format poster / banner it can be provided at 25% of final size plus bleed. Fine or serif typefaces or reversed out type 6pt and under not recommended at 300dpi. Adobe Illustrator - PDF or EPS files. Please supply in CMYK colour mode (unless the files are for specific pms spot colour output / printing) with all images embedded and text converted to outlines. 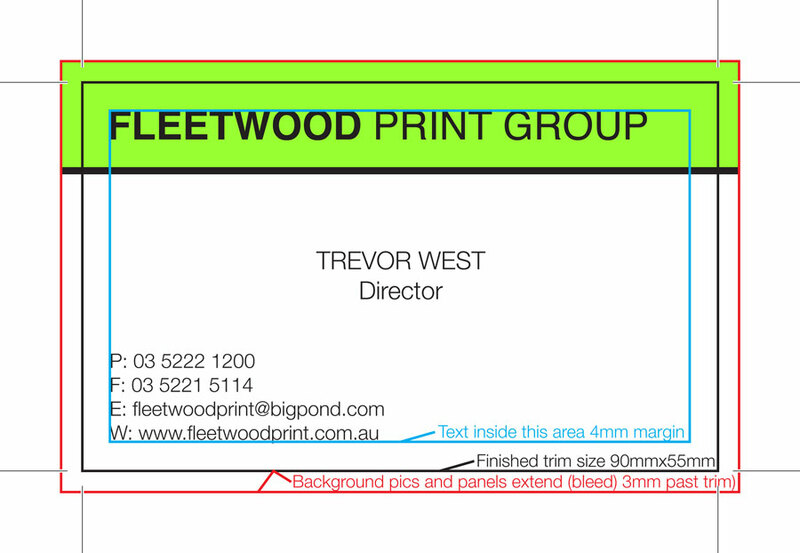 If supplying as Pdf's please ensure you have 3mm bleed allowance, trim marks and be centred on the example as above. QuarkXPress - Using the File> Collect for output menu Quark will gather all the all linked images and fonts used in job into 1 folder. Alternatively you can use the File> Export> Layout as pdf and select press - High Quality / High Resolution from the PDF style menu. Corel Draw - Please convert fonts to outlines, ensure images are embedded and create a high resolution CMYK pdf ensuring that at least 3mm of bleed and trim marks are included. Microsoft Word - Templates are available on this site for our most common formats. Just delete the content on the page and add your own, do not change the margins as they are set to suit our requirements all text must remain within the margins. Note the files with wb in the template name have the 3mm bleed (trim off) added all around please ensure background images or any item that runs off the the edge of the trimmed product extends all the way to the outer edge of the page. (keeping in mind that 3mm will be cut from each edge). Microsoft Publisher - Templates are available on this site for our most common formats. Just delete the content on the page and add your own. Please ensure background images or any item that runs off the the edge of the trimmed product extends 3mm past the edge of the page layout. To package the publication for printing select the File> Pack & Go> Take to a commercial printer, and check the boxes embed fonts, include linked graphics and create links for embedded graphics. Then transfer the files to us. Microsoft Powerpoint - Templates are available on this site for our most common formats. Just delete the content on the page and add your own, do not change the margins as they are set to suit our requirements all text must remain within the margins.